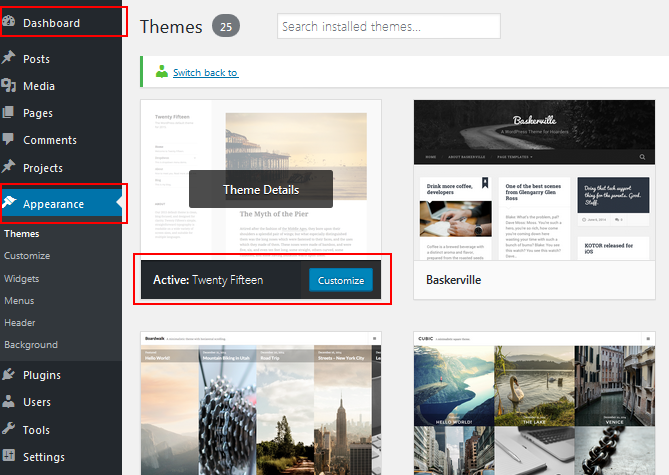 Twenty Fifteen is the default WordPress theme that has been activated on your WebSpace. 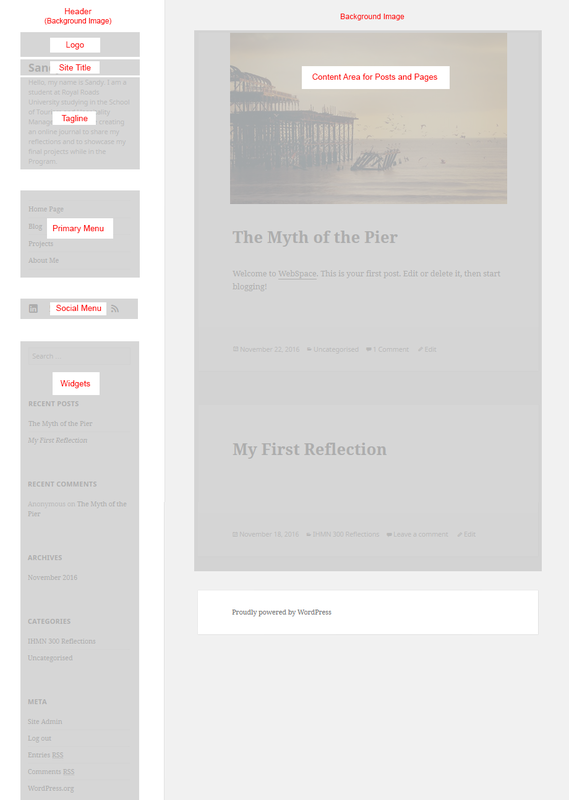 It is a clean, blog focused design. The text is readable on a wide variety of screen sizes and is accessibility ready. More information can be found on the theme in the WordPress.org Codex. Twenty Fifteen uses Noto Serif and Noto Sans, two great fonts available from Google Fonts. 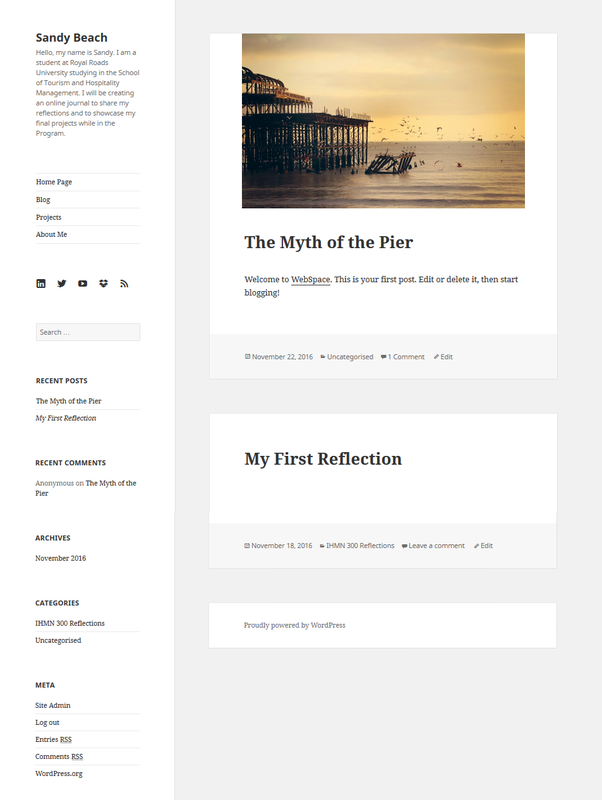 The theme is a two column design that you can use to customize the look and feel of your WebSpace. In this particular theme, the menu and widgets show up in the left side column and any you content you write will show up in the right side column. From your Dashboard and click on Appearance. The Themes screen will open by default and you will see the list of available themes. It will also show your active theme, Twenty Fifteen, along with different customization options. Click the thumbnail photo or click the Live Preview button on any theme to preview the theme without changing your live site. Click Activate to apply it to your site. 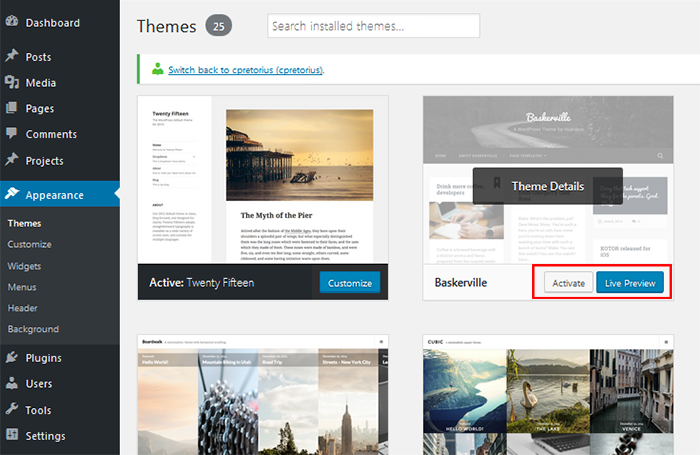 Note: Themes often do not look like the preview photo until you create some content and customize the theme. Switching themes is easy but we recommend that you pick a theme with the layout and features you like before you do alot of customizing otherwise you could lose elements that you did not mean to lose. When you change a theme, nearly everything comes with you: your posts, pages, media, blogroll, and all of your content stay with you. Header and Background Photos - You may need to re-select your photos. Each theme supports different locations, depending on the theme. Colours - Make notes and write down any colours you want to keep. Custom Menus - You’ll want to reassign your Custom Menus to the locations you want them in the new theme. Each theme supports different locations, depending on the theme. Widgets - Take a screenshot of your Widgets, you’ll want to make sure you get them in the right position and order in the new theme. Like Custom Menus, each theme supports different locations, depending on the theme. Custom CSS - If applicable, the only thing that would not come with you is Custom CSS, it is theme specific. Check out Customizing The Appearance Of Your WebSpace to continue customizing your chosen theme. 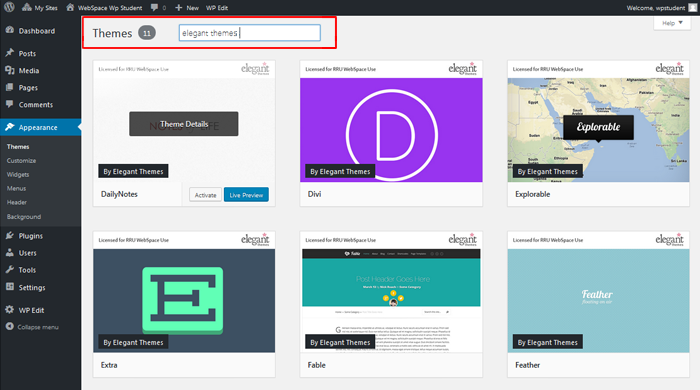 a choice of premium themes from Elegant Themes (ET) under our paid membership license. 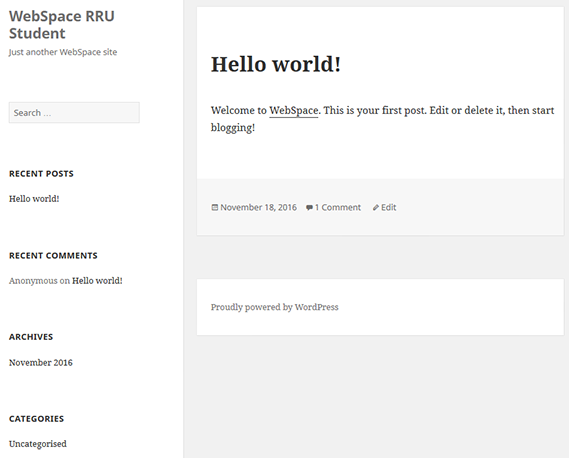 Please note: Elegant Themes are free to try and use while your WebSpace is hosted with Royal Roads University. If you are moving your WebSpace to another host outside of Royal Roads University, Elegant Themes offers several paid licensing options to choose from if you wish to continue using one of their themes. Look under Appearance, Themes, and type in “elegant themes” into the search box to see a filtered list.